This year’s St. Patrick’s Day was celebrated across the country by medical students and residency programs as the eagerly anticipated Match Day. After long months of assembling an application, nervously waiting for interview invites, and flying across the country to visit programs in cities both familiar and foreign, March 17 marked the day on which excited and nervous students learned where they would spend the next several years of their lives training to become independent physicians. Unlike a typical job, where an employer makes you an offer that you can then choose to accept or decline, the National Resident Matching Program uses a statistical algorithm where medical students rank residency programs, residency programs rank medical students, and the algorithm integrates this information to best accommodate the wishes of students and programs alike. Once students and programs participate in the match, the results are binding. While schools have many different types of Match Day ceremonies, Johns Hopkins has a short, simple event. Taking place in the medical education building, students, families and invited faculty members gathered for a brief brunch and to take photos at a St. Patrick’s Day-themed photo booth. Per tradition, first-year students were invited to watch from above, giving them a view of the newly matched fourth-year students in the atrium below and a glimpse into their own futures. A few chosen faculty members and students spoke, reflecting on the journey through medical school and giving advice to get through the first year of residency, otherwise known as intern year, before playing the Match Day video. Put together by the matching class, the video is a tradition that combines the humor, inside jokes and quirky personalities of the matching class. Shortly after the video, students gathered their envelopes, counted down the seconds till noon and simultaneously opened their cards to see where they would be going for residency. Just after noon, the medical education building erupted into a cacophony of screams, cheers and tears. Students celebrated matching at their top-choice institutions, excitedly taking photos of themselves, their envelopes and their friends to share with loved ones who couldn’t attend the event. For some individuals, their match meant making history. For others, matching was a personal milestone, the end of an era spent in Baltimore. While some individuals are continuing their training at Johns Hopkins, many are making their way to a new adventure in a different city — or even a different coast! I was surprised and delighted to discover that I was moving on to my next adventure: Duke University Hospital, to train in internal medicine-pediatrics. Simultaneously, I felt a little sad, realizing that soon, I would be leaving both Johns Hopkins and Baltimore — my homes for the last five years. I think those feelings sum up Match Day in a lot of ways. There’s excitement, surprise and delight, tinged with sense of poignancy. 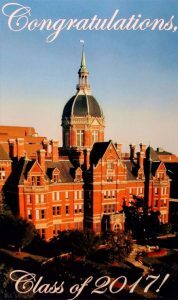 After four or more years of hard work, it becomes real and strange to know that no matter where you plan to go for residency, whether at Johns Hopkins or elsewhere, many things will soon change — the most important of which is your peers, whom you learned and grew with over the last four years. Soon, medical school will become a part of memories rather than a part of the present. While you keep your friends and mentors — and, for some people, your apartment — little else will stay constant over the next few months. March 17 was an exciting day, but now the major milestone is graduation, looming in the near future in May. Or is it late June to early July, when most of us start our residency programs? Either way, congratulations to the Johns Hopkins University School of Medicine Class of 2017, and good luck on the adventures ahead!